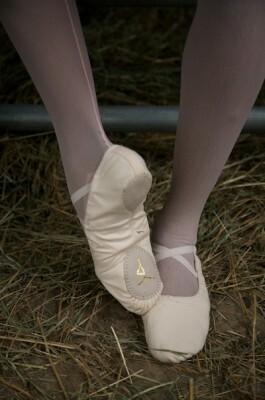 Cynthia King gives dancers a unique way to show their love for animals in their art by providing high quality, cruelty free ballet slippers. As a vegan dancer and choreographer, King did not have any good options for ballet slippers. Even canvas slippers used animal skin on the soles. Providing a viable and affordable alternative to leather-soled slippers became her mission, and after much research (and trial and error), Cynthia King Vegan Ballet Slippers were born, bringing her passion for dance and compassion for animals together. Cynthia King Vegan Ballet Slippers are popular worldwide and were the selected slipper for two of Alvin Ailey American Dance Theater’s innovative camps. These slippers have also attracted the attention of Hollywood—vegan star Emily Deschanel ordered a pair for a scene in the TV show “Bones,” and most recently, Vogue magazine requested a pair for Natalie Portman to wear in their January 2011 cover shoot! You can read more about Cynthia King’s mission and dance school here. 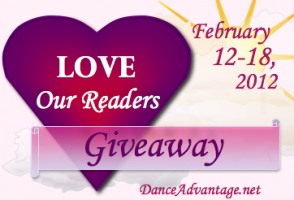 Cynthia King is giving away a Cruelty Free Package to ONE lucky DA reader. Cynthia King Vegan Ballet Slippers (retail $24.95) The only 100% cruelty free slippers readily available! Made of canvas uppers with synthetic soles and stretch drawstring, they are the compassionate choice for dancers of all ages seeking slippers not derived from animal products. They are durable, dye-able, and now come in pink and black for adult sizes. A Cruelty Free T-shirt (retail $30) features the attractive design at left. 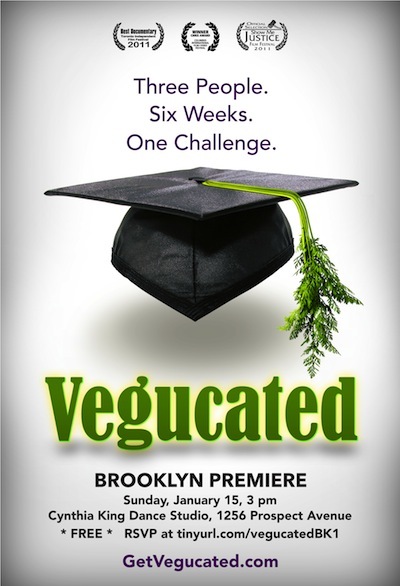 “Vegucated” DVD (retail $25) “Vegucated” follows three meat- and cheese-loving New Yorkers who agree to adopt a vegan diet for six weeks. This entertaining film showcases the rapid and at times comedic evolution of three people who discover their own paths in creating a kinder, cleaner, greener world, one bite at a time. The Cynthia King Cruelty Free Package giveaway is open to U.S. residents 18 and over and closes at Midnight EST on Friday, February 17. In what ways do you connect with or protect animals? Complete as many as you like. Come back and Tweet once every day of the Cruelty Free Package giveaway. Teachers will be impressedwith these useful teaching aids from Dance Teacher Press. I’m not vegan but I firmly believe in mitigating the impact we have on nature as much as we can. I appreciate my pets so much, they give unconditional love & teach me how to be a better person. How brilliant to have a leather less option! I am not vegan but I also believe in mitigating the impact our meat eating habits have on our animal friends. My husband and I have stopped purchasing factory farmed meat. We eat only locally produced foods as much as possible. We open our home to animals in need and we volunteer at the local animal shelter. I’m committed to a vegan diet, and love to discuss my decision to go vegan with others in a civil, respectful, non-judgmental way. There’s no way you’re going to convince someone else to live a cruelty-free life by putting them down! My husband and I committed to a plant based/ whole food diet free of any animal products at the beginning of November and we are working at getting our children all eating the same way. We are trying lots of new recipes and showing them how eating this way can be healthy AND delicious! I know it’s sinking in, when I hear them talking to their friends about it and our middle daughter even wrote about eating a plant based diet for her class at school. We support Farm Sanctuary, Habitat for Horses and several other animal organizations. Would love to win the ballet slippers for my neice who loves to dance…She is just starting to become aware of the vegan way and is becoming a very strong advocate for all it represents…She is in her 3rd year of ballet and jazz and loves music and all my four legged friends.. These would be great for my daughter. I have always loved animals and was lucky enough to be able to take care of hamsters, a toad, and 3 cats throughout my childhood (I currently have to cats). Anyway, my point is – this is a topic that seems to be relevant to my life right now more than it was before. I am not a vegan nor am I a vegetarian, but of course I support the protection and fair treatment of all animals, and I am enjoying gaining new knowledge and perspectives on the matter. I have never herd of these ballet slippers before ; what a great way to take yet another step toward a cleaner, more environmentally-friendly world! As a new vegetarian (working my way towards vegan) I have become aware of the implications on our earth and environment that eating meat and using animal products has. I decided to become a vegetarian mainly for the health reasons at first, but when you see what the animals go through it saddens your heart and makes you angry and makes you want to do more! I’m vegan and love finding cruelty free products to replace things I use!!! It is great to have cruelty free products to purchase and to have them made in the USA is an added bonus. I am a vegan and I speak out for animals whenever I can. We have four adopted rescue dogs!!! I love DA giveaways and my pair of Cynthia King vegan slippers. I’ve always respected animals and lived with some vegans last year which made me a semi-vegan (I rarely ate a non-vegan diet but would be lax when eating out). I think these slippers are a fantastic idea – great work CK! My husband and I, in addition to raising 3 vegan children, do a lot of networking, letter writing, leafleting, and of course cherishing our rescued Border Collie! We also pass out copies of “The World Peace Diet” like they are Halloween candy, LOL! I teach about veganism in my high school Medical Biology class. I have shown many documentaries about cruelty to animals in the food industry. I love to see new things coming out for dancers that involves them in socially responsible movements! This is my second post. 🙂 In addition to our four adopted rescue dogs, we donate $ to animal rescue groups. Most recently, we sponsored a dog to be saved from the Bakersfield, CA hoarding case. The rescue groups are working non-stop to save all of the dogs and cats involved in this case. Vegan ballet slippers are a genius idea! Some of my dance students are vegans and we talk about animal welfare a lot in class… I will definitely be telling them about this tonight! I don’t eat, I try my hardest to only buy products not tested on animals. I used to donate to charities but after having kids & that dance that doesn’t always happen. I plan on doing it again though, animals cannot speak for themselves. I also buy cruelty free products whenever possible. I found a great line of purses that you can find affordable at TJ Maxx that I recently switched too. I never buy leather, but having the extra knowledge that it is cruelty free is nice & they are great designs! 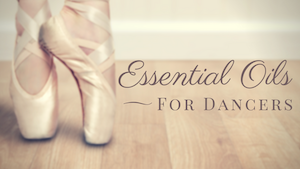 i never realized there were cruelty free dance products, I will be checking out for my daugters! Thought I’m not vegan I do believe it is our responsibility as humans to protect, preserve and take care of the animals and creatures on the earth. I try my best to treat all animals around me with love and care, and teach my children to do the same. I’m a vegetarian who avoids using animal byproducts (leather, rennet, etc.) as much as possible. I do my best to get the animal products I do use (eggs, dairy) from sources I trust. Since I’m allergic to many animals, there’s not so much I can do on a day to day basis that involves actual interaction with them. In what way do I connect with animals? In every way! They’re our emotional side and allow us to relax and be ourselves. Love the intricate lives of animals in nature that surround me, and love my own fur ball that is there to greet me at the end of the day …. no matter what!